Here we go with part 10. The tip of the lone Indian’s nose is at 11,428 feet. The other lakes picked up their related names over the years. Squaw Lake was originally Helen Lake, Warrior Lake was originally Bob’s Lake, and Chief Lake was once Warrior Lake. The name “Silver” (at least in regards to this part of the Sierra Nevada) began when Theodore S. Solomons, who some call the “father” of the John Muir Trail, named Silver Creek in 1892. He thought its rushing water appeared silvery, and thus the name. 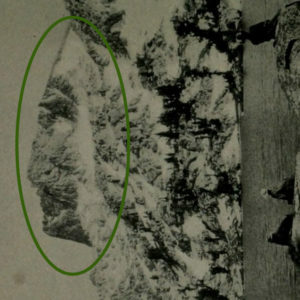 Silver Peak was also named by Solomons, presumably because of its proximity to the creek. The USGS took the name further; when the Mount Goddard map of 1912 was first published the Silver Divide appeared on it, as did Silver Pass. Silver Pass is about eighty trail miles from Happy Isles. As you descend off Silver Pass and walk alongside Silver Pass Lake you’ll know that you have more than a third of the trail behind you. Pocket Meadow. One of the best (and there are many) spots in the Sierra Nevada for wildflowers in the spring, I was not able to discover who named Pocket Meadow. One can assume that the name came from the small “pocket” the box canyon forms in the surrounding terrain. 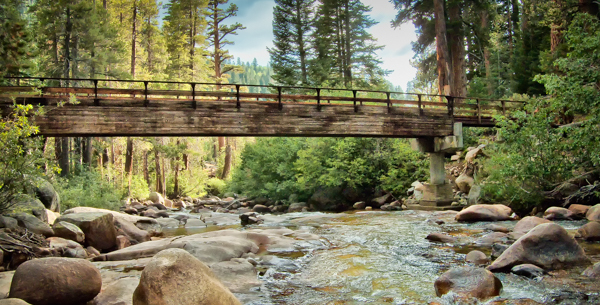 The bridge over Mono Creek. Mono Creek. In 1864 a survey party passed through this area; none of their records indicate that the creek at that time was named “Mono.” By 1894 Theodore Solomons was using “Mono Creek” in correspondence. (Browning, in his Place Names of the Sierra Nevada is quick to point out that Solomons didn’t necessarily coin the name.) It isn’t clear if Mono Creek shares the same provenance as Mono Lake. If so, the name has Indian origins. 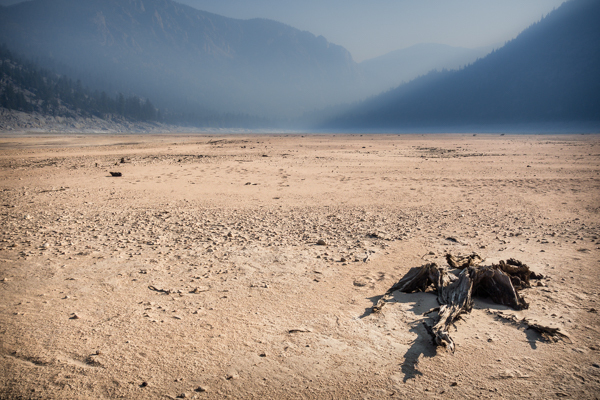 “Lake” Thomas A. Edison during a drought. Lake Thomas A. Edison. This lake, created when Mono Creek was dammed in 1954, flooding the Vermillion Valley, was named for the great inventor. The dam was completed on the 75th anniversary of the invention of the electric light. Vermillion Valley Resort runs a lake shuttle across the lake, to their compound, water level permitting. A little more on the naming of Lake Thomas A Edison. This was not a random tribute. The lake was built by and for the Southern California Edison Company, which was one of the many such utilities that had no direct connection with Edison but was under an obligation to use his name as a condition of using his patented tech. Although Edison was 20+ years dead by the time the lake was built, that cultural influence lived on. Lake TA Edison is not the first such installation that SoBo JMT hikers pass along the trail. Waugh Lake, off to the east of the trail is part of the Rush Creek Hydroelectric Project, which also includes Agnew Lake and June Lake, and is another SoCal Edison project, begun c.1915, courtesy of Gifford Pinchot who also brought you the better known Hetch-Hetchy project. 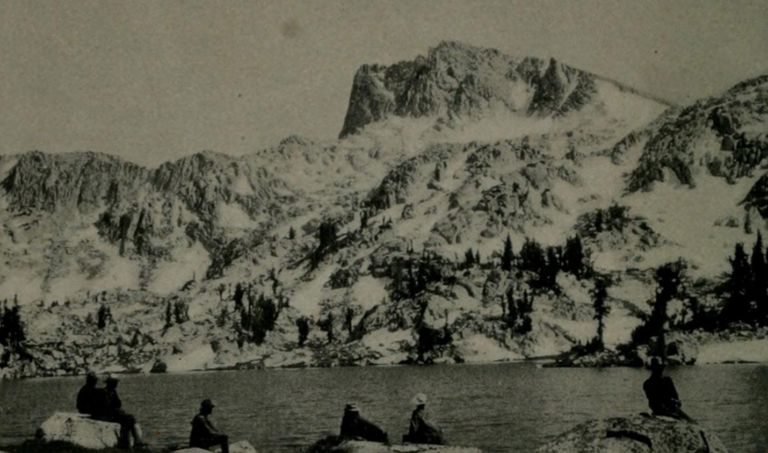 Pinchot got the Rush Creek drainage, plus the Ritter Range, Minarets and asoiciated lake country carved out of the Yosemite Grant in about 1904-1906, paving the way for this earlier SoCal Edison Project and such other scenic delights is the Minarets Mine. Amazing work, Peter. Thank you for your efforts. I’m a first timer in the famous JMT ballot and also one of the only people in Australia I suspect who has downloaded your book and had it bound. Very informative and helpful. However I have a question. I went in the ballot on August 1, 2019 with the 21 day window finishing August 21. Following your lead I usd the five available trail heads to give myself best chance possible. As of this date I have had no luck. Six daily ballots have gone by and I’ve been unsuccessful. Each day there have been no vacancies on the trail head report. However tonight I checked on Trail head report and I see that there a vacancy has suddenly appeared on August 1 leaving Happy Isles, which was one of my choices. How can this possibly be since I was in the ballot process on that day and I am still in the ballot process and I would happily take that permit and yet it hasn’t been allocated. Presumably someone has cancelled after winning the permit in the ballot. Why isn’t it then reallocated to people who are still in the ballot. Is it possible for me to apply for this permit as it is just sitting there? I can’t find any information about retrospective applications for permits which become available after your lottery day is expired. I know I can’t put in a fresh application for a ballot on that day as I am already in the running 21 day ballot Can you help please? It’s very confusing .